According to records the Mughal Emperor Shah Jahan in the year 1632, appointed Rustam Khan to capture the region and establish a fort here and name it Rustam Nagar. The place was however renamed as Moradabad after Shah Jahan's son Murad Baksh, a name that the city maintains to this day. In 1637, Shah Jahan commissioned the Jama Masjid. Moradabad is situated on the west of river Ramganga. As said above, the city is renowned for its brass work throughout the world. It has carved a niche for itself in the handicraft industry, and its products are exported to countries such as USA, Britain, Canada, Germany and the Middle East and the items find pride of place in retail stores such as Walmart and Tesco. 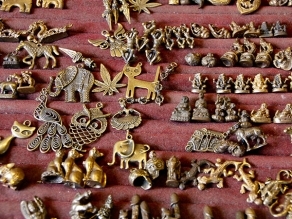 It's brass industry apart, Moradabad has lots to offer to the visitors. As with other cities and towns in India, temples and other religious sites form the backbone of the community. Some of the main temples here include Sita Temple, Bade Hanuman Ji Temple, Chandausi - Kunj Bihari Temple, Sai Temple, Pataleshwar Temple and the Lord Shani Temple. Given its Mughal lineage, there are several monuments that stand testimony to that particular era of Indian history. Some of the most notable ones include Najibudaulah’s Fort, Mandawar Ka Mahal and the Jama Masjid. While in Moradabad visitors can also see the nearby Chandausi ('chand' means moon and therefore, Chandausi is like a moon). This scenic town cultivates the mint plant in large scale and the main product is the mint oil. The town is also home to several religious sites such as Rambagh Dham, Kunj Bihari Temple, Lord Venugopal Ji Temple, and Braham Dev Ji Temple. For some family fun and relaxation, you can head to Prem Wonderland and the Prem Water Kingdom. The Raza library in Rampur caters to the literary buffs and is a treasure trove of Indo Islamic learning and arts. Moradabad can be reached by air, rail and road conveniently. The ideal time to visit Moradabad is from November to April, the weather being mild and pleasant during that time. However, since it is a major industrial hub, Moradabad invites visitors the year round. Moradabad is an important industrial hub and is served by trains from all major cities in India. The main railway station is Moradabad Junction which receives trains from cities such as New Delhi, Kolkata, Mumbai, Chennai, Agra and Varanasi. Various express trains and superfast trains ply on this route. The closest airport is New Delhi. From here, you can hire a cab and reach Moradabad in less than three hours via NH-24.